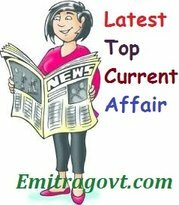 Current Affairs Question 2017: Looking for 16 September Current Affairs? Then start your Quiz right now by answering them. Here in this article, we are giving the Current Affairs Quiz with Questions and Answers. As many people are preparing for various government exams it became mandatory for them to get a grip over the current affairs as in most of the tests are based on Daily Current Affairs. By taking this kind of Current Affairs Quiz candidates can eventually get hold of what they have been working on. Contenders can trust us as we will update all the latest Current Affairs in this quiz. For more such quizzes check our site Emitragovt.com regularly as we will update the Daily Quiz for current affairs. 1. Indian swimmers won 47 medals, including eight golds, at the 9th Asian Age-group Aquatic Championship. This tournament was held from September 8 to 12 at Tashkent in Uzbekistan. 2. According to the Japanese financial services company Nomura, India’s GDP growth will be 7.1 percent in the current financial year. 3. India has been placed at a low 103 rank, the lowest among BRICS economies, on the World Economic Forum’s (WEF) Global Human Capital Index, which has been topped by Norway. 4. Online restaurant guide startup Zomato has acquired logistics company Runnr. 5. Prime Minister Narendra Modi and Japanese Prime Minister Shinzo Abe laid the foundation stone of India’s first bullet train project that will run between Ahmedabad and Mumbai. 6. According to research agency Kantar Millward Brown’s ‘BrandZTop 50 Most Valuable Indian Brands 2017’ list, HDFC bank has retained the top slot for the fourth year in a row while Reliance Jio has been ranked 11th in this list. 7. Jawaharlal Nehru Port Container Terminal (JNPCT) has been awarded ‘Container Terminal of the Year’ Award for the above 0.6 million TEUs category at The Gateway Awards 2017 held at Mumbai. 8. India and Japan signed a MoU for expansion of an international laboratory set up for a collaborative research in the area of biotechnology. 9. Wholesale inflation rose to a four-month high of 3.24 per cent in August. Inflation based on the wholesale price index (WPI) was 1.88 per cent in July 2017 and 1.09 per cent in August 2016. 10. Government of India has notified issuance of Commemorative Coins of Rs. 100/- and Rs. 10/- denomination on the eve of Birth Centenary of Dr. M S Subbulakshmi. Commemorative Coins of denominations Rs. 100/- and Rs. 5/- have also been announced on the occasion of Birth Centenary of Dr. M G Ramachandran.